After a few years in business, you may find that your needs have changed or that your original forecasts were slightly off. If you’ve purchased high-quality equipment, you’re probably having a hard time coming to terms with the fact that this equipment just may not be suitable for your needs! The upside to discovering this costly mistake is knowing that there may be other options aside from outfitting your kitchen with newer, more appropriate units. Your walk-in freezer can be refurbished into a walk-in cooler to reflect your restaurant’s needs, but it’s a little more complicated than simply turning up the temperature. Have a look at these tips to see if changing your freezer to a cooler is do’able and appropriate for your restaurant. You may be thinking, ‘I’ve already got the insulated unit; Why not just turn up the thermostat to reflect the temperatures of a walk-in cooler?’ In fact, changing the thermostat to a warmer setting can be detrimental to your unit’s life and can send the components into a tailspin! Your freezer compressor is responsible for regulating temperatures, and they need low temperatures to function properly. Freezer compressors run at a low pressure and require the low temperatures to do so. Raising the temperature on your unit also raises the pressure, and this can cause undue stress to your freezer compressor! Because the compressor now has to work even harder, it’s lifespan is dramatically shortened. When you change your walk-in freezer to a walk-in cooler, you’ll in fact need to invest in a new refrigeration system to reflect the new needs. The new system will need to be tailored to what is, in essence, your new unit that simply utilizes old insulation structures. Also, many have recommended a CPR (Crankcase Pressure Regulator) to accommodate the old compressor in this new environment. At the same time, some units have compressors that may work well in both a cooler and a freezer, so the best option is to call a professional from the manufacturer who can appropriately modify your freezer. While it is easier to go from a freezer to cooler than the other way around, you’ll still want to pay attention to the effects of removing a defrost cycle. Your drain pan and line may simply be put out of commission if you’re changing to a cooler, but there’s more work that’s needed if you’re planning to convert from cooler to freezer. Either way, you’ll need to have a professional modify your unit’s defrost cycle as it requires different forced or powered defrost and the drain pan and drain need warmers. If you’re thinking of converting your refrigerator to a freezer, simply changing the compressor and evaporator won’t be enough! The freezer requires a vent port in the door and a heater in the door frame, at a minimum. Consult the manufacturer to see what your requirements are. You may want to consider the cost of a new walk-in unit compared to the labor costs of having your old unit modified. New lines, new refrigerant, new valves, and new compressor units all add up, and the manufacturer can help you determine what’s best for your restaurant. 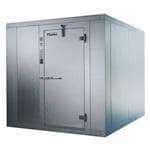 760816-X (QUICK SHIP) Walk-In Cooler or Freezer 7'-9" x 15'-5" x 7'6"